Many people enjoy watching TV as a way to relax. I’m one of those people. Since we cut the cord on our overpriced cable contract three years ago, I have been looking for ways to watch the content I enjoy without spending an arm and leg for it. That search has included trying to figure out how to watch USA Network without cable. When I want to catch up on some of USA Network’s popular shows like The Sinner, Suits, Unsolved, and Queen of the South, I need to find a way to stream USA Network for free or find other shows to watch. If you want to know how to watch USA Network without cable this post will show you all the ways to do it. Ten years ago, an expensive cable contract or satellite TV deal was the cost of enjoying your favorite TV shows. The answer to the question, ‘can you watch USA Network without cable?’ was simply, ‘no.’ Today, that’s no longer true. There are many solid streaming options that make it possible to watch USA Network online and no cable subscription is required. If you’ve been looking for a way to get USA Network without cable, any of the following streaming services will let you do it for much less than the cost of your cable subscription. Are you hanging on to your cable subscription because you don’t want to lose access to USA Network, HGTV, History Channel and other popular networks? If so, then Hulu with Live TV is worthy of consideration. Hulu with Live TV is an excellent replacement for cable and a great way to watch USA Network without cable. If you’re familiar with Hulu, Hulu with Live TV is an upgrade of its legacy $7.99 per month plan. All of Hulu legacy’s content is on-demand. Hulu with Live TV adds live streaming content for a variety of popular networks, including USA Network, to Hulu’s large library of on-demand content. The best part about Hulu with Live TV is that it is only $39.99 per month. That’s $70 per month less than the average cable contract. If you want to watch USA Network live stream, Hulu with Live TV is one of the best ways to do it. The Hulu with Live TV channel lineup is solid. From sports to news to content that kids love, there’s something for everyone in your home to like about Hulu Live. Plus, it has no contract and you can cancel or downgrade your service to legacy Hulu at any time. If you do, you’ll face no fines or penalties. What channels are included with Hulu with Live TV? The above list scratches the surface of their offerings. If you’ve been looking for how to get USA Network without cable, Hulu Live is an easy way to do it. Learn more about Hulu Live by reading our comprehensive Hulu with Live TV review. Like many of the streaming services mentioned here, you can try Hulu Live for free for 7 days and see if you like it risk-free. Sling TV is one of the leading streaming services on the market. Sling has had years to fine-tune its streaming platform and it shows. The menu and navigation makes it very easy to find what you’re looking for fast. Sling TV’s reliable streaming quality and intuitive design make it one of the best solutions to watch USA without cable. Many popular channels, including USA Network, are available through one of two packages – Sling Orange and Sling Blue. Considering what the average American pays for his or her cable or satellite service, signing up with Sling TV could save you up to $80 per month. Plus, you will still be able to watch all the latest episodes of popular USA Network shows like Suits and Queen of the South. If you’ve been asking, ‘How Can I Watch USA Network without Cable?’ Sling TV could be the answer. Like many of the most well known streaming services, you can get Sling TV free for 7 days. Test it out; see how well you like its channel guide and streaming quality risk-free. If you don’t like the service, cancel your plan and pay nothing. It’s a smart way to watch USA Network without cable. Learn more about the channel lineup, platform, pros and cons of Sling TV in our Sling TV review now. If watching Suits for less isn’t the only reason you want to cut the cord on your cable contract and you really enjoy live sports content, FuboTV could be the ideal streaming service for you. FuboTV began broadcasting international soccer matches years ago and quickly became the leading way to watch soccer on TV. Today, it has expanded beyond soccer to include tons of live sporting content as well as lifestyle and entertainment programming. Not only does FuboTV let you watch USA Network without cable, it also gives you access to many other popular channels. What channels are included with FuboTV? The above list scratches the surface of what FuboTV offers. FuboTV’s channel variety shows just how strong the market for streaming services has become. You’re not missing a thing when you cut the cord on your overpriced satellite TV contract. Learn all about FuboTV, including how its cloud DVR works, in our FuboTV review. FuboTV’s base package, which lets you watch USA Network without cable, costs $44.99 per month, which puts it right in line with Hulu Live and still significantly less than the average cable plan. Get USA Network free now with a FuboTV 7-day free trial. Like Sling TV, DirecTV Now has had a long time to refine its channel guide and user interface. That reality makes DirecTV Now one of the easiest streaming services to use. Its intuitive menu, solid streaming quality and variety of available channels make it one of the more exciting alternatives to cable out there today. We’ve tested DirecTV Now several times and think it delivers a pretty good user experience. Not only can you get sports and news through DirecTV, you can also get USA Network without cable through DirecTV Now. Stream USA Network online with DirecTV Now’s “Live a Little” plan, for just $40 per month. Not only can you watch USA Network live, you can also go back 72 hours to access USA Network shows on demand, when it’s convenient for you. Want to learn more about DirecTV Now? Read our DirecTV Now review. Many people think of PlayStation Vue as a great way to watch sports without cable. Yet, it offers a thorough channel lineup of the most popular news, family and lifestyle entertainment content as well. The fact that you can watch ESPN, HGTV, CNN, Disney Junior and USA Network without cable makes PlayStation Vue an alternative to cable worth considering. While PlayStation Vue has several different plans and channel packages, the Access Plan for $44.99 per month will let you watch USA Network without cable. As already mentioned, PlayStation Vue is a solid choice for live sporting events since it offers ESPN, ESPN2, and ESPNU. You don’t need a PlayStation console to watch USA Network without cable. You can watch all of PlayStation Vue’s content on your laptop, desktop, tablet, smartphone, or smart TV. PlayStation Vue plays nice with Amazon Fire TV and Amazon Fire TV Stick as well as Roku, Apple TV and a variety of other popular streaming platforms. That means all you need to get USA Network without cable is an Internet connection and streaming platform, which could be as simple as your web browser. As with the other options already mentioned, you can try PlayStation Vue for free for 7 days to see if you like it before paying a dime for it. It seems whenever I give my kids time on their iPads these days, the first thing they go to is YouTube. (I still don’t understand how my youngest can waste so much time watching moms unwrap toys on YouTube). For those of us who would rather watch USA Network without cable, YouTubeTV is a great way to do it. YouTube has been doing a lot to promote its live TV streaming option. For only $40 per month, you get more than 50 channels, including ESPN, ESPN2, and ESPN News and of course, USA Network. You can watch USA Network without cable risk-free through YouTube TV as they offer a free trial, which allows you to test drive the streaming service for free. Can I Stream USA Network Free? If you’ve been searching the far reaches of the Internet, typing in search terms like ‘watch USA Network live online streaming free,’ you’ve probably been disappointed with your search results. That’s because there is no way to stream USA Network free. Unfortunately, it’s just not possible to watch USA Network live stream free. To get USA Network live stream online you need a login for the USA Network app. While a login from your Internet Service Provider (ISP) might work, you’ll most likely need a login from a cable provider to access the full content of the USA Network app. That means there’s no way to watch USA Network shows and full episodes for free online without a cable subscription. While this isn’t good news, thankfully, you can watch USA Network online with one of the streaming services mentioned. 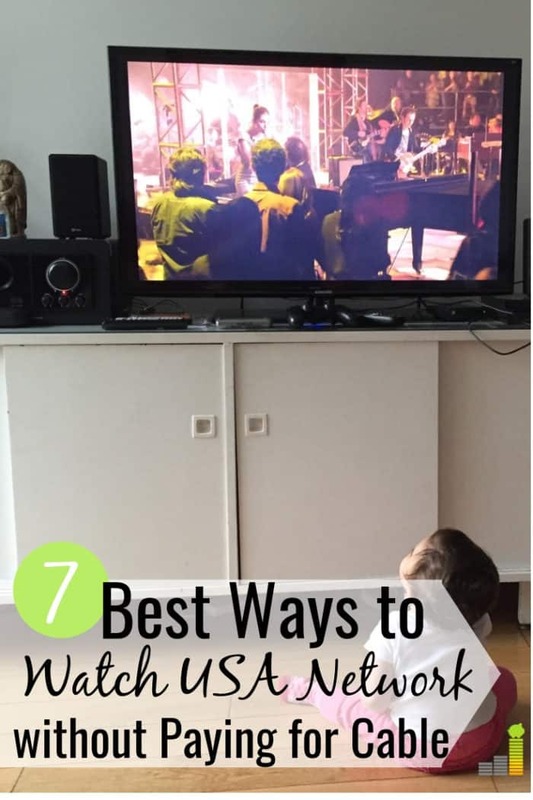 Hulu with Live TV, for example, is accessible through a web browser on your computer, tablet or smartphone, which means that your subscription will allow you to watch USA Network live stream from anywhere with an Internet connection. Can I Watch USA Network on Apple TV, Chromecast, Fire TV, or Roku? If you’re wondering whether you can watch USA Network on your favorite streaming platform, you’ll be glad to know that episodes of USA Network shows are available through all of the most popular platforms. You can even watch USA Network without cable on your web browser, which means you can take your favorite USA Network content with you wherever you go. Does your satellite service offer the same functionality? There’s no reason today to shell out $110 per month on a cable plan to watch USA Network. You can watch your favorite USA Network shows without cable through any of the streaming services mentioned here. If you aren’t sure which one to choose, try Hulu Live free with its free trial option. Then sign up for some of the other streaming services covered here one at a time for free using their free trial options. By the time you exhaust all your options, you’ll have enjoyed more than a month of free TV and will have a good idea of which service you want to start streaming. Are you tired of paying too much for USA Network and other TV content you enjoy? Cut the cord on your expensive cable plan and put the $50+ you’ll save each month to better use. How do you watch USA Network without cable? What other channels keep you from cutting the cord? How much money do you spend on cable or cable alternatives each month? The post How to Watch USA Network without Cable appeared first on Frugal Rules.